In this video Steve K. will attempt to teach how to make a switch ball with the bender back style. Why the Bender Back way? To do this I recommend first you learn to pull your own color. Its like a right of passage to know one thing before you move on. But either way, here you go on how to do this amazing glass blowing technique. Now you have control of this piece of colored tubing. Start out now with a really small flame and heat this lined tubing up in the center. Once you can feel that you could bend the tubing you are about right with the heat. Now you will want to bend the glass. This is for sure strange, but you will spin it in a jerking motion as you have to spin both sides at the same time and same amount. This pushes and pulls the glass making the bend in the color. Its so NEAT! Do not heat the glass up too much, just enough to bend the glass. It is ok if you get some devint, it will go away as you make the ball. Now you will do your termination. I do not care what way I spin these, I just spin them in the opposite direction of the last wig wag. If you try to go with the wig wag you will get like a stair step effect. If this is what you want then go this way, if not go the opposite way. Spin and pull this down so it is smooth. Now you have a like spun cone, get this end thin and pull pull off the tip so it is just a little thing. Now melt this down evenly. Now you will pop a hole in the side of the ball you are making. I prefer to go small, then make the hole bigger. I try really hard not to let it get too wet. I want the color and clear to be centered in the glass so when I put the next switch ball on it the clear and color line up. If the color melts out to the outside you can have a boily color come out and that will not be good. You always want the clear on the outside with the color on the inside. With you hole in the side you will punty up to it and remove the blow tube. While you are removing the blow tube you will want to give it that spin to match the other spin. Use a sophieta or bent glass so you can blow out this cone. Be careful not to let it gather too much as the colors will over lap each other and make a bad termination. Its all about the termination here yall!! Repeat this on another switch ball and put the hole on the oposite color so you can put one to a blow tube and then put the two wig wag switch balls together. 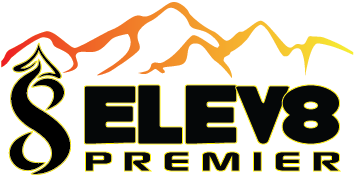 Learn on the You Tube channel at Elev8 Presents and also our Entertainment site Elev8 Presents.com.